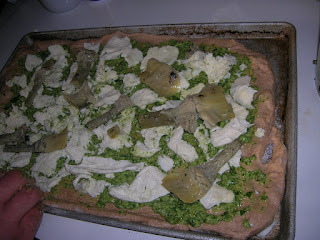 In another cheese-related post for this month, Carla and I made our first attempt at making mozzarella this weekend. As a fresh cheese, mozzarella doesn't use the cultures I mentioned in my first cheese-making post to develop flavor. Since it's eaten fresh, all the flavor comes from the inherent qualities of the milk. We discussed doing it with a gallon of raw milk, but that'll wait for a future endeavor. 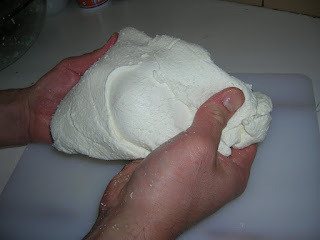 Making mozzarella is actually pretty straightforward. Add 1.5 tsp citric acid to a gallon of whole milk, heat to 90 F, then add your rennet and allow to set into a big, wobbly pot of jell-o milk. Cut this into curds, then gently warm the curds to tighten them up and expel whey. We heated our milk a bit higher than we wanted, but that just resulted in a tighter, springy-er texture. At this point, you need to get those curds out of the watery whey so you can start making them into cheese. But they still have too much moisture in them, which isn't good unless you're making a runny cheese like Brie. So you can either dunk it in hot water or nuke it in a microwave for 1.5 minutes. We went for the microwave. This makes the curds tighten and push out more whey. Now you knead it like dough. 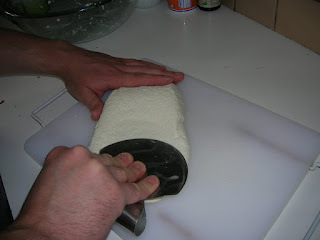 Since the cheese-dough is piping hot, I found using my dough bench scraper made the job a lot easier for handing the hot cheese. Work the cheese until it gets a nice, shiny surface, then eat and enjoy! In his book, The Food Life, cheese and specialty food guru Steve Jenkins talked about the joy of putting an in-store mozzarella station in each of his Fairway's supermarkets. What caught my attention was that he loved selling mozzarella freshly made--and warm--as is the tradition he saw in his repeated cheese-buying tours of Italy. This really surprised me, as even the fancy buffalo milk mozzarella I get from Italy is shipped at around 36-40 F. His point was that since the cheese is so delicate when fresh, refrigerating it tightens up the paste of the cheese, making a tender cheese tough and rubbery. While my mozzarella-making skills do need some work, this cheese was still quite tasty, and especially so when spread over a whole wheat pesto pizza with artichokes! I'm thinking next time I may make a double batch to age. It's a little known metamorphosis that if you take mozzarella, rub it in brine and allow it to hang and age for a few months, you'll soon get what the Italians call provolone. Or caciocavallo, if you shape it like a pear.